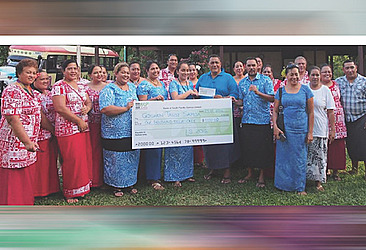 The Leadership Samoa Class of 2016 (LS2016) donated $1,000 to the Goshen Trust and $2,000 worth of goods to Samoa Prison and Correction Services (S.P.C.S) as part of their LS2016 community project last week. “These tours have enabled us to witness some of the most pressing issues facing Samoa, and we want to act immediately to make a difference,” explains Bernie Tauaanae, of LS2016. This year, LS2016 has taken an approach to address the needs that can be immediately identified and remedied through the program by the LS2016 participants. “We chose Goshen Trust after visiting their facility, learning of the services they provide and discovering their needs as an organisation,” explains Victoria Petelo of LS2016. “The challenges facing SPCS are no secret to Samoa, but the management and the staff are doing their best with the available resources for its maintenance and sustainability,” explains Tuugalei Lesā of LS2016. “The LS2016 class identified that the growing population puts a strain on daily meal rations. We saw this as an immediate challenges that LS2016 can address through donations and contributions. These donations were presented by LS2016 to Tuaena Lomano Paulo, Chairman of Goshen Trust Board and Assistant Commissioner Operations of the Samoa Prisons and Correctional Services, Afioga Sagaga Galu Frost and the staff and matai of Tafaigata Prison. “We, LS2016, believe in making a difference and it is our goal to act accordingly to cater as much as possible to assist not only the community but Samoa as a nation. Team LS2016 is looking forward to implementing more assistance this year and is committed in utilizing its skills and knowledge in helping the people of Samoa,” said Mulitalo Bernie Tauaanae of LS2016. Leadership Samoa offers a unique program that provides the platform for emerging leaders to appreciate the bigger picture of the pressing developmental issues facing our nation today. The program fills a niche with the delivery of a holistic cross-sector professional development program for emergent leaders and aims to raise their awareness of key political, economic, social, technological, environmental and cultural issues facing the development of Samoa today, thus ensuring a pool of well-informed Samoan leaders in the future. The organisation was established in 2010 and is funded by the Pacific Leadership Program (PLP). PLP is a regional initiative of the Australian Government that recognizes the pivotal role of leadership in development. PLP works at the regional level, and nationally and sub-nationally through country programs in Samoa, Solomon Islands, Tonga and Vanuatu.